Altamura is a city in the region of Puglia (English: Apulia), in the province of Bari in south-eastern Italy, sort of at the top of the heel of the boot. 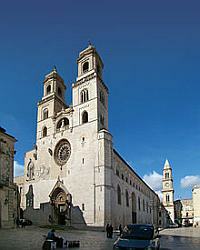 It is 45 kilometres (28 miles) inland from the coastal city of Bari, itself. The population is slightly more than 70,000. When you say, "Altamura," what do most Italians think of? The spectacular Romanesque cathedral (image, left) built by Frederick II in 1232? (He didn't physically lay the bricks. Holy Roman Emperors usually had others do the heavy lifting for them.) The megalithic walls beneath the city, erected by an as yet unknown ancient people? The dinosaur footprints? Well, those are all good, good and good, respectively, but no, no and no, respectively. Italians hear "Altamura" and think, aaaaah, the BREAD! (image, right). Roman poet, Horace, said, "The water here is the worst in the world! But the bread is exceedingly fine. Even a weary traveller will carry some with him on his shoulders." Altamura bread is made from durum flour and in 2003 was granted PDO status within Europe. That stands for Protected Designation of Origin, meaning that in order to be called Altamura bread, it must meet a range of demands, including variety of wheat, certain specifications of water and method of production, and then it must have a final crust over 3mm (0.1 inches) in thickness. If you sell anything else and call it Altamura bread just because it was made there, the Italian state will send in SWAT (Special Weevil Assault Team) to infest you. Altamura is also well-known for Altamura Man, the 400,000-year-old calcified remains of a hominid believed to be Homo heidelbergensis. In October 1993 Altamura Man was discovered by speleologists in a limestone cave, the Grotta di Lamalunga, near the city. I mentioned dinosaur footprints. They are important, too. No, early hominids did not live at the same time as dinosaurs. If you are one of those persons who think they did, please leave. Last, but certainly not least on my Altamura list is the Archaeological Museum. It was founded in 1891, then closed in 1909 "for lack of interest"(! ); people didn't get re-interested in the museum until the latter years of the 20th century. Now it has a wealth of findings that date from the early Bronze Age to the late Hellenistic age. The museum has everything from everyday objects, such as vases and personal possessions to weapons and tools, much of which was recovered from the necropoli of Altamura, Gravina in Puglia, Toritto, Cassano Murge, Ginosa and Laterza. There are number of sections within the museum. One covers the period from prehistoric times to the early Middle Ages; another contains temporary exhibits that the Museum holds on a regular basis; one entire floor is given over to the Altamura Man. There is also a significant display covering myth, history and life as depicted in the famous "red figure" Apulian pottery. The display shows how local ceramic production begins in the last years of the 5th century BC in the cities of the Ionian coast (that is, the "sole" of the boot of Italy). 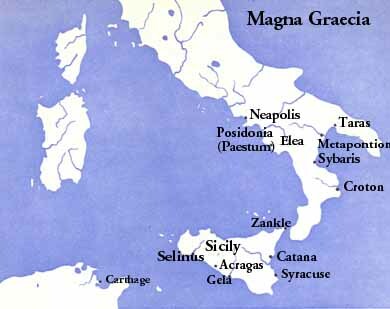 This production was meant to imitate Greek production, broadly diffused by the 5th century throughout the Mediterranean by the spread of Magna Grecia. Italian production, however, quickly incorporated its own elements to reflect local social and political conditions. So, all in all, you have everything from depictions of Greek themes such as the Trojan War to local coronations, weddings, battles...whatever. The museum of Altamura is a good one. I was going to say how disappointed I was that the museum, except for the snack shop, has no special section dedicated to the bread. Did I mention the bread? As it turns out, they have special limited bread-o-ramas(!) such as the one advertised in the image, a poster for the exhibit entitled the "The Prehistory of Food," this particular section dedicated to "The Origins of Bread." AND the city of Altamura has, indeed, opened a special Bread Museum in the building that used to house the administrative office of the Puglia Aqueduct. That's close enough. All this talk of dinosaurs and prehistoric man is making me hungry.